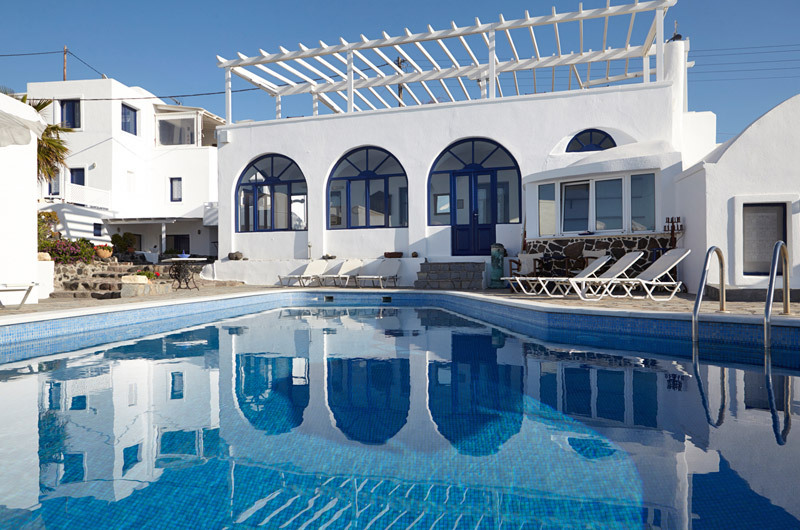 Agnadi Villa is located in the most beautiful village of Santorini, Oia in Finikia area. The apartments, which are built according to the typical traditional style of the island, are set up in a building surrounded by a garden. From the private balconies you can enjoy a view to the sea and the sunset. You can also see neighbouring islands and of course the magnificent Oia village. You can enjoy your drink at the pool bar and admire the idyllic sunset of Oia. The apartments are spacious and individually designed. They have kitchen, bathroom, phone, private verandas and daily service. Each apartment is lovely, decorated and furnished with elegance. Breakfast is served at the restaurant of the complex. Your stay at Villa Agnadi and our familiar hospitality will be unforgettable. Children under 5 years old are free of charge while sharing parents room.